While only the third episode of the third season of Outlander, “All Debts Paid” somehow manages to incorporate many important events from the novel, Voyager, into an hour of television. While the events in the episode could have spread two or three episodes, the story condensation ended up being well done. The major events covered in “All Debts Paid” include: Claire’s (Caitriona Balfe) graduation from medical school, Jamie’s (Sam Heughan) stay at Ardsmuir prison, Jamie meeting Major John Grey (David Berry), Claire being confronted by the open relationship with Frank (Tobias Menzies), Murtagh (Duncan Lacroix) is alive, Claire and Frank’s talk of divorce, Frank’s death, Duncan Kerr’s (Murray McArthur) arrival and death, Jamie’s escape from prison and visiting the silkie’s island, and Jamie’s departure from prison and arriving at Helwater. If I were writer Matthew B. Roberts, I would have been a bit aghast at how much I had to squeeze artfully into my script. There had to have been a concern for this episode when the writers discussed what each episode would include from Voyager. The only complaint about the overall feel and depth of this episode is that we do not get a good enough impression that Jamie was in Ardsmuir prison for as long as he was. According to Outlander Lists & Timelines, Jamie arrives at Ardsmuir in May 1753 and leaves in 1756. Grey arrives at the prison in 1755. The biggest deviation from the books thus far happened in this episode. Rather than dying on the fields of Culloden, Murtagh (Duncan Lacroix) was taken to Ardsmuir. The reappearance of a dead man in a prison alongside his godson is the best change from the book that fans could ever hope for (in my humble opinion). The character of Murtagh is beloved by many, and it is a testament to how Duncan Lacroix portrayed him that the fans would welcome a big change from the books. The sick Murtagh at the beginning of the episode caused me to think they may just kill him off in a less ambiguous way. This way he is dead and buried, and there will be no hope of his return. Contrary to this, he is bound for the colonies in America as Jamie and we say farewell to Murtagh again. One can hope that means he will reappear in season four in some capacity and be a lasting character for the many seasons of Outlander to come (hopefully). Frank is not seen as that bad of a husband until this episode. While Claire and Frank may no longer be having a physical relationship, they are still married and united in raising their daughter, Brianna. The first scene between Claire and Frank rectifies the situation and makes Claire face head on that Frank is involved with other women. While he is discreet, almost too much, it still shakes Claire that her husband is cheating on her. Proceed further down the timeline; Frank erroneously schedules a date with Sandy (Sarah McRae) when Claire is still at home for her graduation party. If looks could kill, Frank and Sandy would be dead. Claire has never had to meet any of Frank’s lovers, and it upsets her that Frank could be so callous especially when Brianna is present. It is a tipping point in their relationship, one that comes to blows later in the evening. There are two tour-de-force performances by Caitriona Balfe and Tobias Menzies, and both are the arguments about Frank’s infidelity and the second revolves around him wanting to leave the marriage with Brianna in tow. While the arguments take place about ten years apart (guessing here), the issues are the same and Jamie is still the third person in their marriage. The last argument is all for naught as Frank is killed that night in a car accident. The steadfast, determined Joe Abernathy (Wil Johnson) coming to notify Claire and her immediate reaction to the news, may not impress the Frank Haters in the fandom, but it recalls that there is no Jamie without Frank. Frank was Claire’s first husband and first love, and he will always be important to the story and the lives of Claire, Jamie, and Brianna. I, for one, will miss Tobias Menzies in these episodes and I can only hope that Ronald D. Moore has flashbacks planned for future episodes and seasons. The letter Frank begins to write in episode 301 looks to be a moment worth returning to in service of details that book readers do not even know about. The relationship between Major (not yet Lord) John Grey and Jamie is of utmost importance for the coming episodes as well as the coming seasons (we only have season four guaranteed right now). That kid that tried to kill Jamie in season two is back as an older, nice-looking Redcoat, now tasked with running Ardsmuir prison. 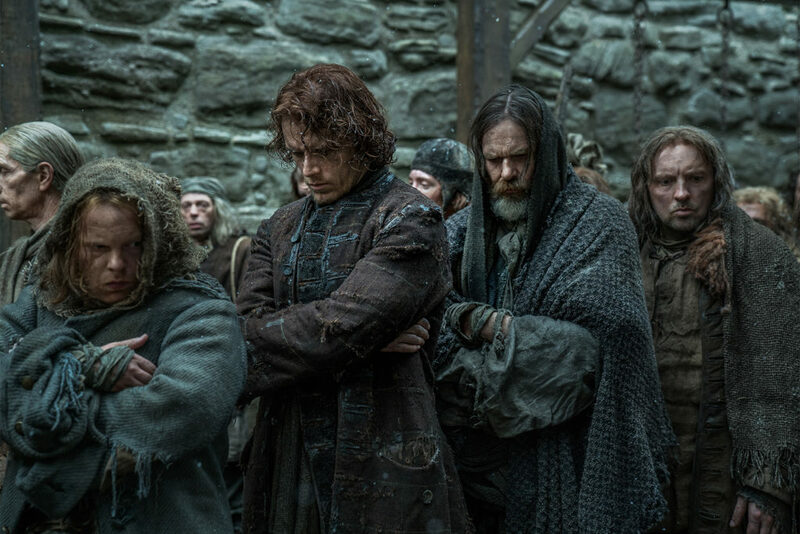 Grey knows exactly who “Red Jamie” is when he first sees him, but it takes a bit for Jamie to remember who he is, as we learn in his conversation with Murtagh. Jamie is playing the long game with Grey, and while he figures out who he is, he never lets on, waiting until the right moment to spring it on Grey. While they have a testy relationship in the beginning, an understanding that resembles a friendship develops. Of course, Grey puts this at risk by making advances towards Jamie and wanting him to do things he does not want. By the end of the episode, we realize Grey is a man of honor, and while Jamie is questioning his motives, he is powerless to escape his bond with Grey. The arrival of a supposedly deranged man babbling about possible treasure puts Grey in the position of asking Jamie for a favor or a command. 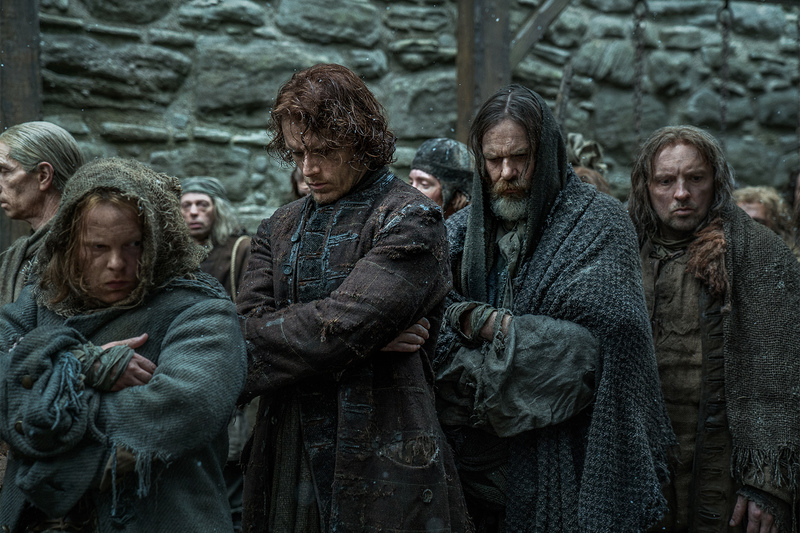 To make him more honest, Grey takes Jamie’s shackles off and somewhat promises to treat Murtagh’s illness. Duncan Kerr is on his deathbed but is speaking in French and Gaelic, both languages Jamie knows. He speaks mostly in French, and I find it hard to believe that Grey does not speak French or can’t get the gist of what Kerr is saying. Through the haze, Jamie surmises that there may be treasure on an island inhabited by silkies (and a reference to Jamie’s mother and father) and possibly a white witch. The white witch conjures up hope in Jamie that Claire may be there. Jamie makes an artful escape to the island and reappears to surprise Grey. There are scenes of Jamie on the island in several trailers for season three, but they were not used in this episode. His escape may be revisited in a future episode. Just like in the premiere episode of this season, “All Debts Paid” ends with both Claire and Jamie starting new phases in their lives. Again, the time passed faster for Claire than it did for Jamie in these seemingly parallel stories. The death of Frank sets up Claire for her return to Scotland with Brianna (Sophie Skelton) and makes her “free.” On the other hand, Jamie is not free in any sense of the word. He is only moving on to another part of his life. The pacing of all three episodes thus far has been fantastic, and there are not many dull moments. The season is racing towards the reunion between Jamie and Claire, but it is these episodes of them apart that reveal new pieces of them through trials and tribulations. P.S. If you wished Grey had blonde hair like in the book, you got a glimpse in two outdoor scenes between Jamie and Grey. His wig is a sandy blonde. A little bit of a continuity issue, possibly, or was this scene shot first and then production went with a wig that matches David Berry’s real hair color? This entry was posted in Brendan Maher, Caitriona Balfe, David Berry, Duncan Lacroix, Episode Reviews/Recaps, Matt Roberts, Sam Heughan, Sophie Skelton, Tobias Menzies, Wil Johnson and tagged All Debts Paid, Brendan Maher, Caitriona Balfe, David Berry, Duncan Lacroix, Episode Review, Matthew B. Roberts, Murray McArthur, Sam Heughan, Season Three, Sophie Skelton, Tobias Menzies, Wil Johnson by Sarah Ksiazek. Bookmark the permalink.